Our number one priority is your satisfaction! Centar Industries has been in the locker business since 1983. We began as a locker and locker parts distributor. Why choose Centar for your new locker installation? 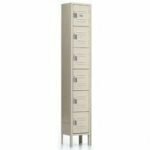 If you don’t know the manufacturer of your lockers email us a picture and we will identify it for you. We work to get the best price and quality. All manufacturers are not equal; because half of our sales are repair parts we can educate you on which manufacturer will provide years of trouble-free service. We represent every locker manufacturer, therefore, we can shop the market for you. If new lockers are not in your budget visit our locker refurbishing page. Whether it’s new lockers or refurbishing your old lockers Centar will make it work for your school or business.